Our sixtieth meeting was decked out in purple, green, and gold decor as we belatedly celebrated Fat Tuesday. While Lilly was inspired by the Italian flavors of a muffuletta, she hates olives, so she opted to make an open-faced sandwich featuring vegetables, veggie meat, cheese, and a basil aioli. 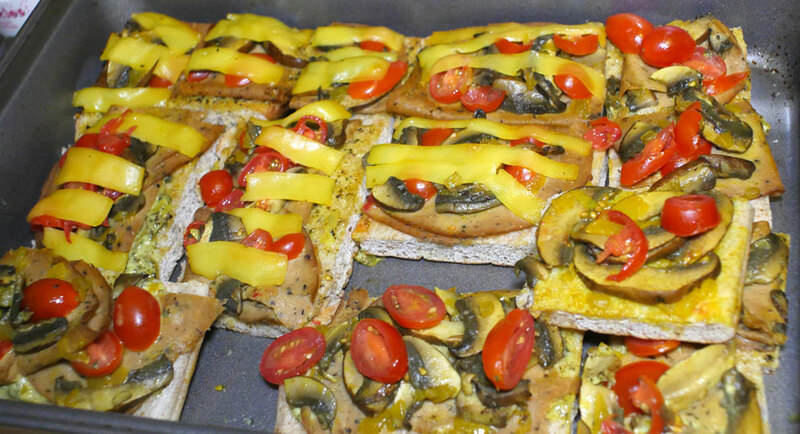 On pieces of Barbari bread, she layered portobello mushrooms, onions sautéed in turmeric, Tofurky® Peppered slices, cherry tomato, and Field Roast soy cheese. She offered aioli on the side, made with Vegenaise®, basil, and more of the turmeric onions. 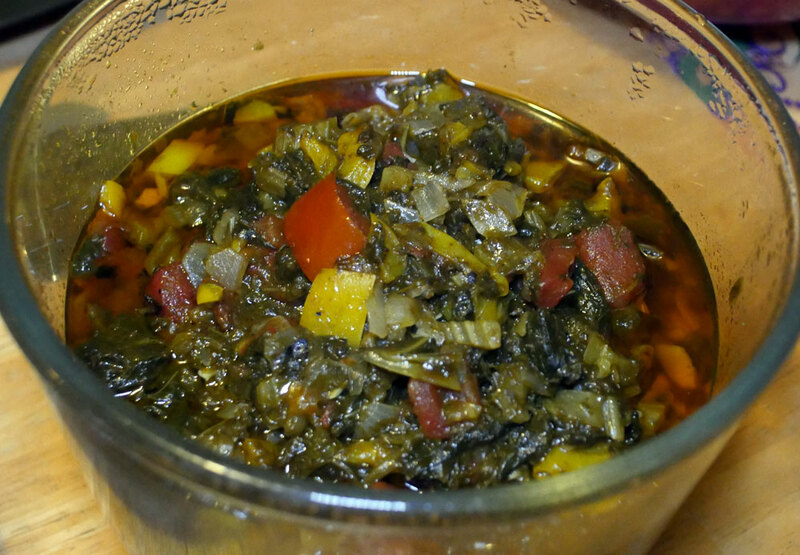 Hope and Igor brought us a smoky side dish prepared from collard greens and other veggies. After de-stemming and boiling collards for thirty minutes, they chopped them up before adding them to a sautéed blend of minced yellow bell peppers, onion, celery, and garlic. For even more flavor, they added fire roasted chopped tomatoes, Old Bay seasoning, and hickory liquid smoke. 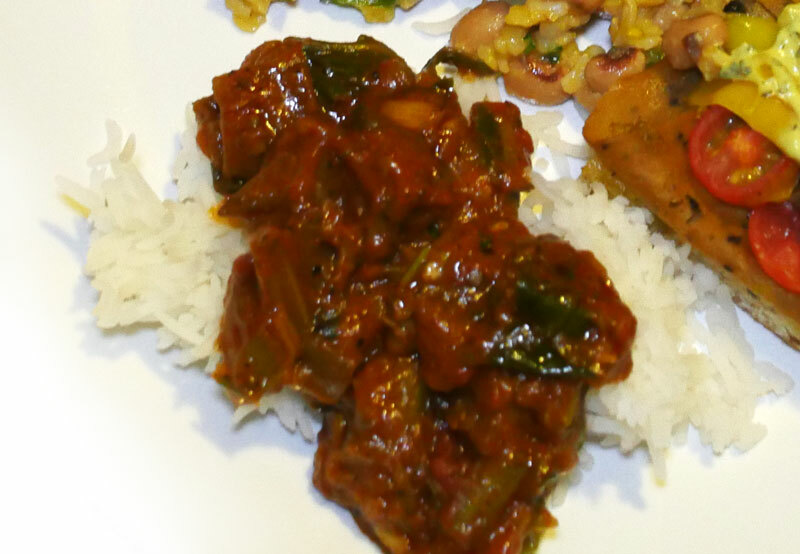 Shannon combined three recipes to make her red bean and okra jambalaya. She put green bell pepper, onion, celery, okra, diced tomatoes, green chiles, vegetable broth, a vegan chicken flavored bouillon cube, salt, pepper, cumin, oregano, thyme, and Cajun seasoning into a slow cooker. She cooked this for five hours then added uncooked rice for thirty more minutes of cooking on high. 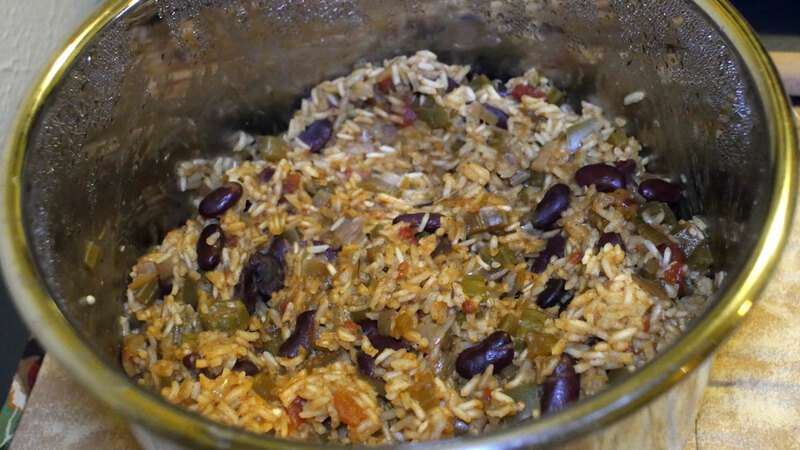 At the end, she mixed in a can of red beans for extra texture and protein. 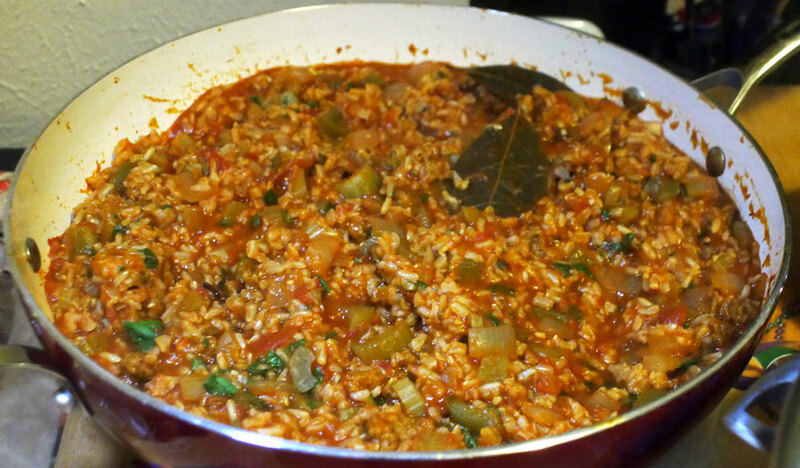 Drew somewhat followed an online recipe to make his seitan jambalaya that contained bell pepper, onion, garlic, celery, jalapeño, crushed tomato, seitan, and Cajun-y spices including garlic, bay leaves, pepper, salt, vegan Worcester sauce, paprika, and hot sauce. Billy cubed two eggplants and cooked them down in a pan with olive oil before adding a can of diced tomatoes, garage grown green onions, Swiss chard, and Italian parsley. 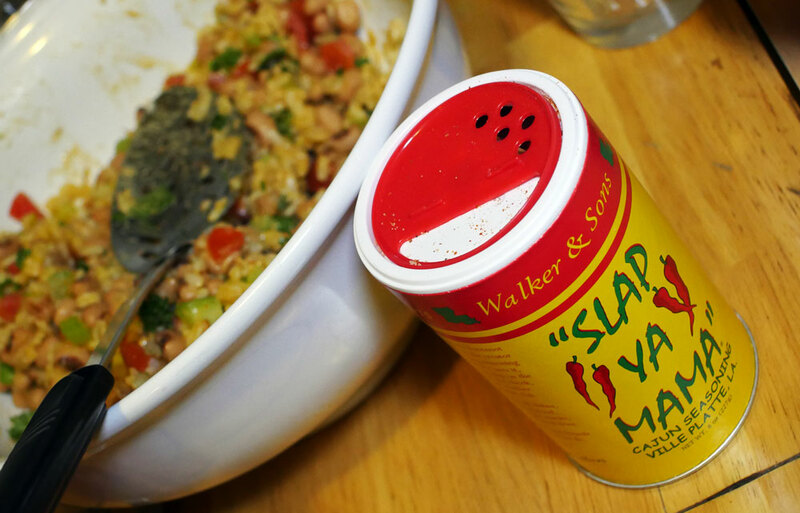 He seasoned his etouffee with a blend of Cajun seasonings including smoked paprika, garlic, black pepper, and salt. He served it with a side of rice. Wanting to make something a bit lighter than some of the other fare expected at this Vegan Bake Club meeting, Slynn made us Hoppin’ John Salad from a PETA website recipe. For assembly, she combined cooked brown rice, black eyed peas, celery, tomatoes, green onion, and fresh parsley. She flavored the salad with lemon juice, olive oil, fresh garlic, and Slap Ya Mama Cajun seasoning made in Ville Platte, LA (salt, red pepper, black pepper, and garlic). For her king cupcakes, Slynn made her favorite go to vanilla cupcake batter from Vegan Cupcakes Take Over the World, dressing it up with orange extract and swirling in a mixture of chopped pecans, cinnamon and brown sugar for fun and flavor. 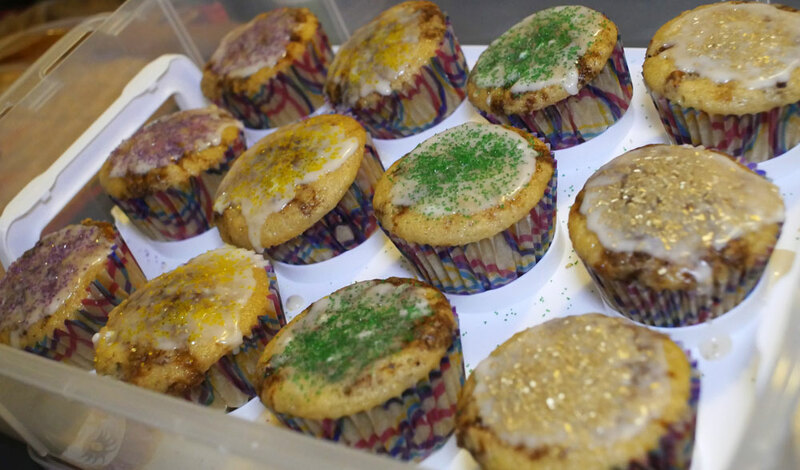 She topped the little cakes with an almond milk powdered sugar glaze and green, gold, and purple sprinkles. She put a black eyed pea in one cupcake for the baby, but if anyone got the baby-containing cupcake at our gathering, [s]he must have eaten it without knowing. Lauren made beignets by veganizing this New Orleans Beignets recipe. She made it with bread flour, rapid rise yeast, water, sugar, coconut cream, Spectrum shortening, and a flax egg (1 tablespoon of ground golden flax seed mixed with three tablespoons of water). 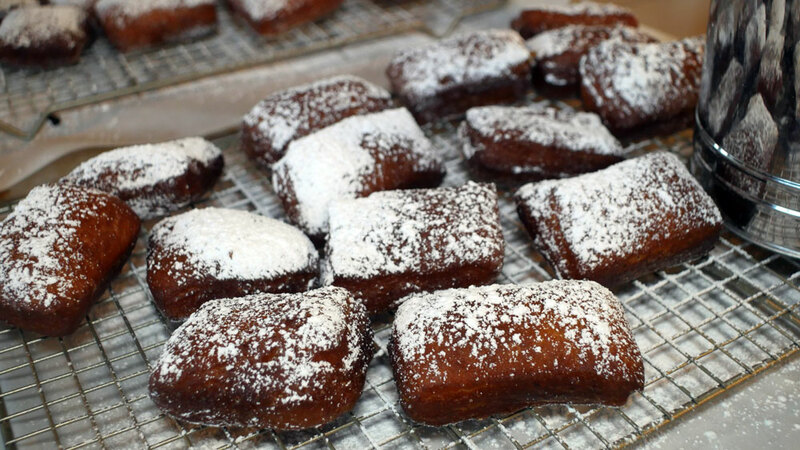 She fried the beignets in canola oil, let them cool, then sifted powdered sugar over both sides. 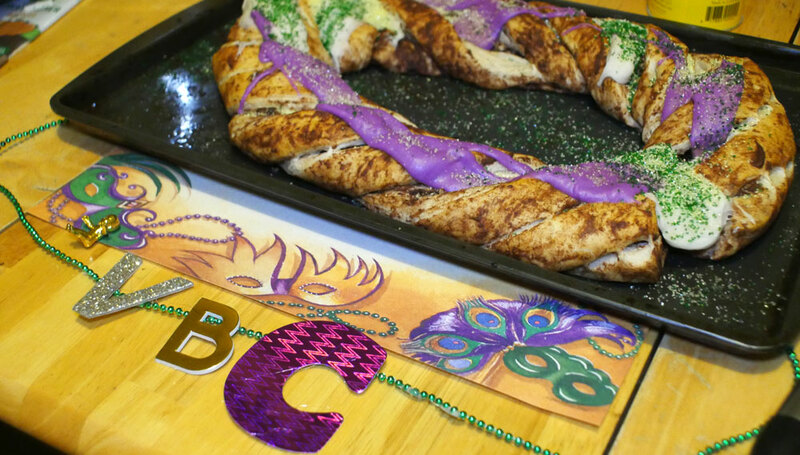 Caroline made a quick king cake by using a couple cans of cinnamon roll dough. To sculpt the miraculous creation, she separately laid out each sheet of dough, spread chopped almonds that had been tossed in vegan butter and rum over them, and rolled each up into a long tube. She twisted the two pieces together and wrapped them into a ring shape. She decorated the cake with the cinnamon roll icing that came packaged with the dough after thickening it with xanthan gum and coloring half of it with purple food coloring. For further accoutrement, she added green and yellow sprinkles for the Mardi Gras feel. To serve as a baby, she stuck a whole almond in the cake (seemed safer than the plastic baby she got at Scrap!). However, Lilly accidentally cut the baby’s head off while slicing out her piece. 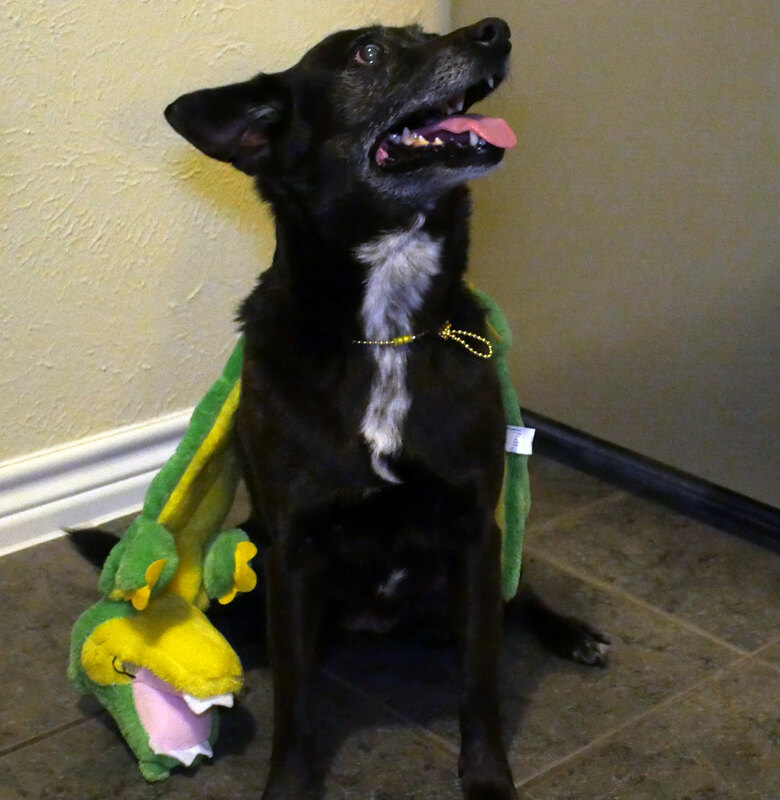 Even though she decapitated the baby, she is expected to bring the king cake next time! Macy enjoyed the parade of food!